The 2018 Canal Music Fest hit a bump in the road—due to some pesky and unwelcome storms. But a little rain can't get us down! We were able to get everything dried off and Tusk—The Ultimate Fleetwood Mac Tribute hit the stage at 8:00pm—and as they say—better late than never! Once the rain let up, folks started streaming in. Tusk was phenomenal and a good time was had by all! We are already in the planning stages for our 10th Annual Canal Music Fest! Can you believe it? We got some special things in store for our 10th so check back soon for more information. 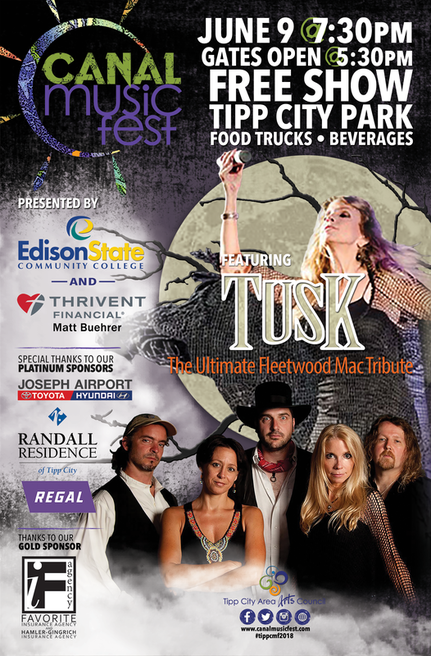 You can find out more about Tusk—The Ultimate Fleetwood Mac Tribute on their website and then jump over to Facebook and click "LIKE"!